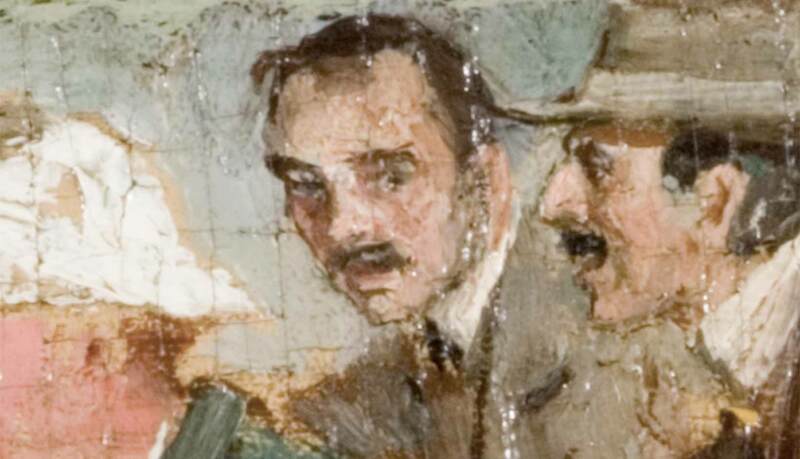 Indeed, it was probably Voorhees who suggested to Henry Ward Ranger that he look to Old Lyme and the Griswold boardinghouse in his quest to find a suitable location to establish his artist colony. Voorhees was familiar with both the town and Miss Florence from trips he took to the area as early as 1893. Voorhees was mad about his “wheel,” as he called his bicycle, and would clock thousands of New England miles on his cyclometer. Three years later, Voorhees boarded in Old Lyme at the Bacon House, while his mother and sister stayed at the Griswold House, a fledgling boardinghouse operated by Mrs. Robert Griswold and her daughter Florence. During these early visits he would spend his days duck hunting and painting. Mr. Voorhees shows . . . ‘December Moonrise,’ a moonlit snow scene, with a row of leafless trees stretching across the picture in the middle distance, and the crooked little brunette stream that finds its way into so much of the Lyme painting winding bright and dark between the blue banks. The light lies softly on the snow, and through the branches of the trees is seen a cool sky. The picture is so large, so simple, and quiet that at first glance it has a look of emptiness, but its dignity and spaciousness grow upon one with every moment of attention given to it. Although trained as a chemist at Yale, Voorhees was more interested in collecting bird nests and sketching. His journal entries after his long bike rides reveal an artistic eye and soul: “The country we passed through on the way up was an ideal New England farming district. . . The road passes by very old farm houses and by fresh bottom lands covered in wheat.” In 1894, he began taking art classes in the evening that eventually led to his studying at the Académie Julian in Paris and touring around Europe with his new artistic friends. My father kept to a regular routine. He spent mornings in his studio and no one was allowed to disturb him during those hours. 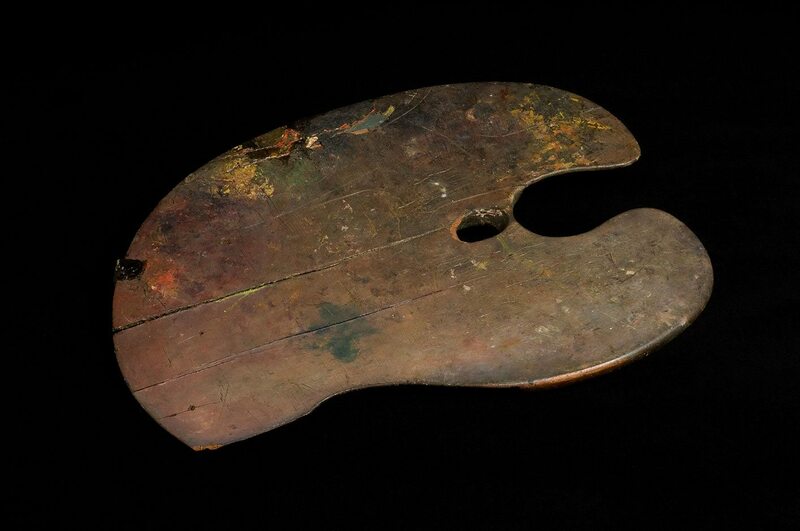 He was a neat painter, but the studio was cluttered with all sorts of things. He worked very quickly. He was patient and a good teacher. Sometimes gave private lessons, but did not like to. He had a good sense of humor and also a good practical approach to local affairs. Voorhees returned to America in 1900 and came to Old Lyme the following year to stay in the Griswold boardinghouse with his fellow artists. He fit right in. 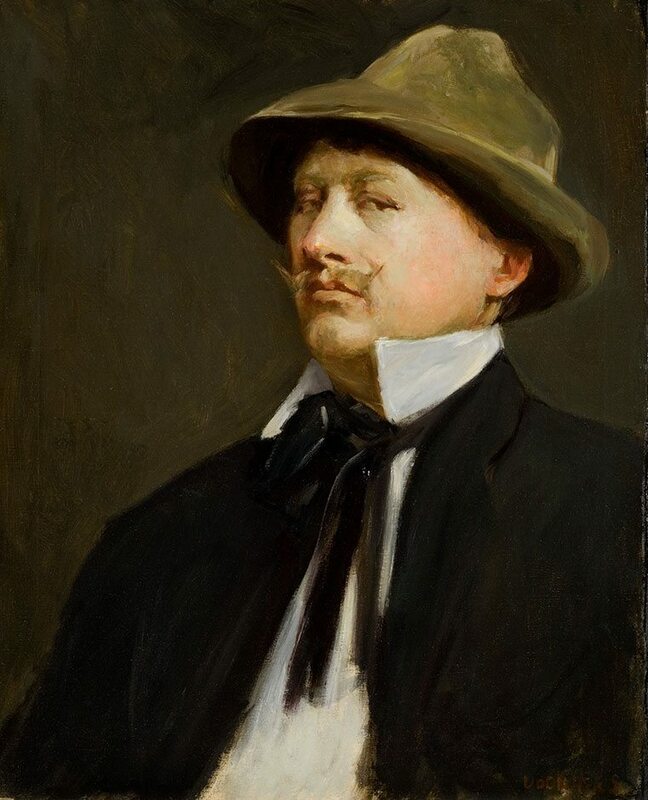 Voorhees’ diary from the summer of 1903 listed baseball games, canoeing, picnics, tennis matches, trips to the beach, and evenings of poker, whist (an early form of bridge), and musical entertainment, in addition to the business of painting. He was so enamored with Old Lyme that he bought a house at the end of the painting season and moved there permanently with his new wife the following summer. Named Ker Guen, meaning “white house” in Dutch, the Voorhees house overlooked the Connecticut River and, along with the lush flower-filled gardens, was painted by several Old Lyme artists. 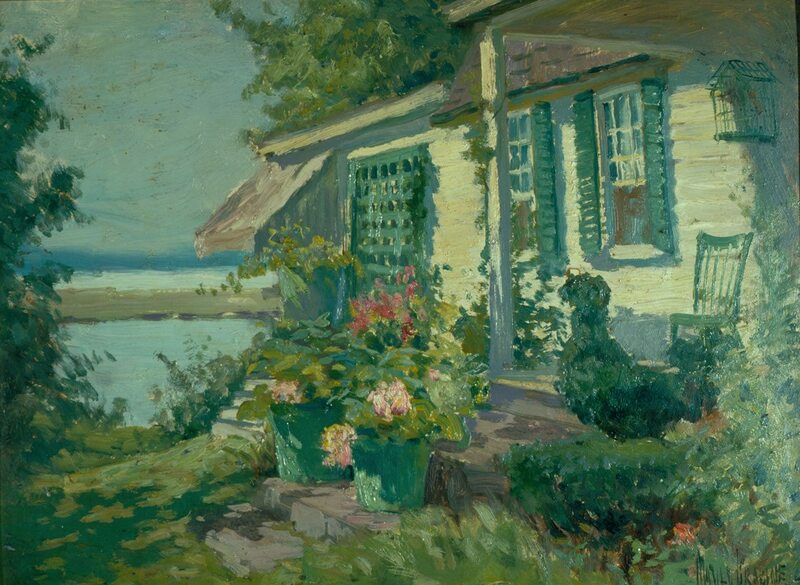 Coming early to Old Lyme and staying late, Voorhees’ artistic style ran the gamut from dark tonal landscapes to brighter impressionistic scenes. Fascinated with moonlight and snow, Voorhees would adapt his style to the particular subject at hand. 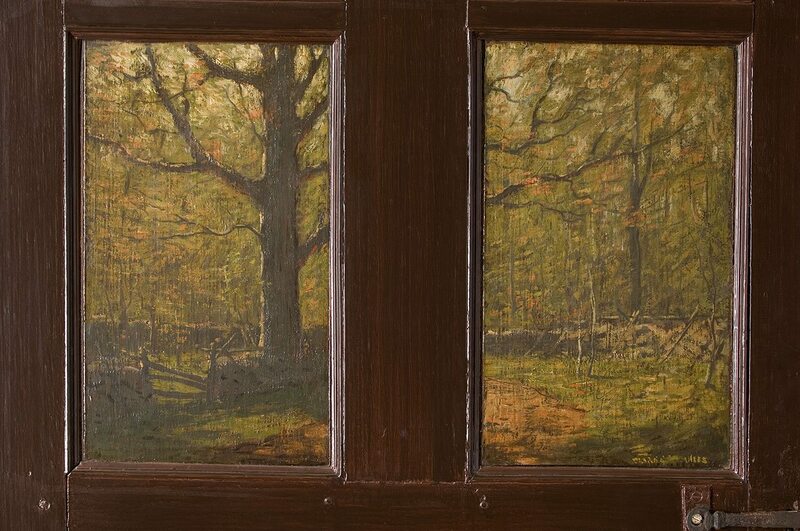 In the dining room, Voorhees offered Miss Florence one of his local landscapes in his pair of panels on the door leading to the back stairs, titled The Whippoorwill Road. Here he captured a quintessential Lyme scene, with a country road leading past the stonewalls of a small farm that, over time, has been reclaimed by the forest. In Old Lyme he bought a small sideboard from a lady in the back woods who had it in her chicken coop. He even collected broken teacups, because he liked them, not for their value. He found Indian arrowheads and axes. He knew a lot about all these things and was able to give his children an appreciation for the things he enjoyed.